This Mackinaw City hotel features standard rooms, some with balcony or patio overlooking a park setting, one-, two- or three-room chalets and a new two-story log cabin with loft and jacuzzi that sleeps 6. The Econo Lodge Bayview in Mackinaw City also features Pirates Adventure Indoor Waterpark with pirate tipping bucket, 3 waterslides, geyser, bubbler jets, crawl tunnels, waterguns and climbing nets. Guest also receive unlimited passes to 1400 feet of private beach on Lake Huron. 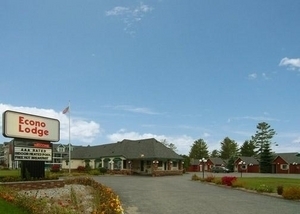 The Econo Lodge Bayview is located near Mackinaw City restaurants and shopping, the Mackinac Bridge, across the street from Mackinac Island ferries, Fort Michilimackinac State Park, and Historic Mill Creek.